First of all, how cool is that band name? I mean, the image it conjures, of being completely alone in some dense forest somewhere, snow covering the trees and the ground, totally lost, and then encountering a ravenous pack of wolves who keep getting closer and closer… what an intense sensation of terror, isolation, and utter helplessness that produces. Aren’t you already starting to feel better? And we haven’t even heard any music yet! I first became aware of ECW when their song “Alone, into the Silence of Ice” (from their 2009 full-length The Silence from Your Room – see the end of this post for more details on that one) was included on a compilation from my favorite blog ever (which is now, sadly, deceased) Sludge Swamp. That song really made an impression on me, with its heavy, ponderous drumming as well as blasts of double-kick parts; deep, sludgey bass and doomy guitar riffs combined with some bombastic leads; and the deep, dark death growls — more than anything, I’d say it would belong in the same category with fellow Finns Hooded Menace. Well, earlier this year (28 February), the band had bestowed follow-up Chapter III upon the world by way of Bandcamp, and this week they’ve announced that the CD version is available for sale through the Dethroned Productions division of Throne Records. The only bad news is that the EP has just two songs, totalling a far-too-brief running time of fifteen minutes. The good news, though, is that most CD players (or MP3 players, if you prefer) have a “repeat” function. I have been taking advantage of that fact most of yesterday and today, and IF there is a number of times listening to these two songs where you will get tired of hearing them, I haven’t yet found that number. The first song, “In the Trench,” represents the first half of the EP’s title, both thematically as well as by the overall aesthetic atmosphere of this track. Again, we encounter the idea of extreme solitude and dispair; after all, there aren’t many places on earth that are further removed from all human contact than in a chasm several miles beneath the surface of the sea! The setting for this song could represent the deepest depths of depression (especially considering the fact that a trench is literally a depression in the ocean floor), or perhaps it could even be thought of as a glimpse into hell (figuratively, given that trenches are caused by collisions between plates where one is forced beneath another, deeper toward the earth’s mantle). On hearing this song (see the Bandcamp player just beneath this description), either interpretation might be valid. Without any delay from an introduction, we delve immediately into the guitar riffs. The production here feels very murky, definitely evoking the idea of a place where no light has ever shined. Drums, bass, and guitars sound not just sludgey and thick, but so oppressively heavy that they accurately convey the experience of being so far underwater that your whole body would simply be crushed like an empty can. Then, when the vocals materialize, they seem to float up to your ears from that nearly bottomless pit; if typical death metal vocals are compared to the Cookie Monster, here he has been cast into that hole in the ocean floor, killed by the weight of the water pressure, but pulverized by it so completely that his soul remains trapped in that fuzzy blue shell of a dead body, forever stuck down in that abyss, his ghost left to haunt any who will listen with its tale of eternal agony. Yes, I would definitely say I am feeling much more cheerful now. Obviously, the other part of the EP’s title refers to the second song, “Picturesque, Petrified.” Now, there are several places in the world where there are petrified trees under the ocean, and those are only ones that have been uncovered by shifts in the tides; who knows what vast forests may exist out there that haven’t even been discovered yet. At least, that is what I’m picturing here, the hero of our story encountering a forest of stone during the course of his underwater adventure. 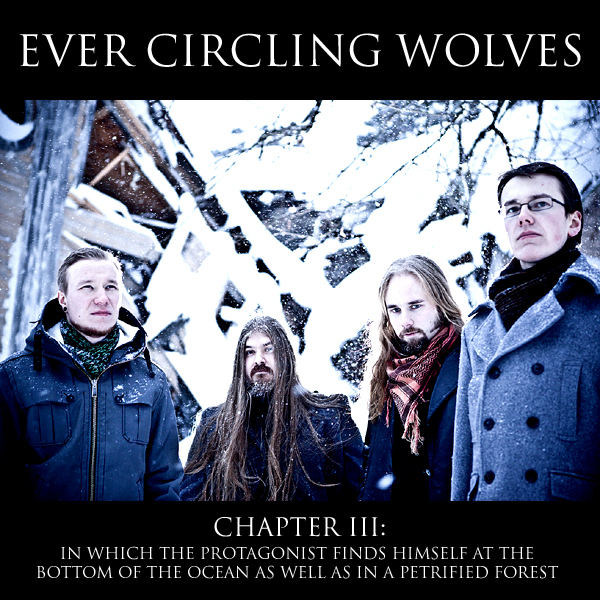 That might not have been the intent when the song was written, because the original version of this song was also the title track of Ever Circling Wolves’ first EP from 2007. That one had a very limited release, and I haven’t heard any of it (nor am I aware of it being available anywhere) so it’s hard to say whether the song referred to an underwater forest, or one that is on dry land. However, when you listen to this version of the song, newly recorded for Chapter III, it has the same gloomy, dismal sound and opressive heaviness as the first track, which makes it feel as though the scenery hasn’t changed too dramatically. It has changed somewhat, though, because the sound is not identical. The biggest difference is in the drums: while the snare and cymbals still are smashed with the lumbering gait of a monstrous paleozoic beast, the bass drum part is full of double-pedal rolls and plenty of other fancy footwork, in addition to the standard straight-sixteenths normally found in extreme metal. This subtle difference adds a frenetic undercurrent beneath everything else that is happening; again sticking with the idea of a submerged forest, I envision schools of fish darting among the fossilized logs and stumps, in pursuit of smaller fish to eat. The vocals here have a very similar tone to those in the previous song, again lending to that sensation of a tormented ghostly figure trapped in the darkest depths of isolation and dismay. Even though the song is over eight minutes long, it never feels like it is dragging; in fact, just before the end, the intensity starts increasing (especially in the drums), seemingly building to a frenzied climax, but suddenly it’s just over. And, click here to visit the Dethroned Productions web store where you can buy the Chapter III CD. Finally, as promised, here’s the Bandcamp player for their 2009 full-length The Silence from Your Room. This is available to listen to for free, and to download (for whatever price you want to pay), just like the new EP. One more quick note, ECW guitarist/vocalist Henri Harell informs me that they still have a few copies of the full-length on CD as well, so if you’re interested in that, check the website (link above) to get in touch with them. This entry was posted in Free Downloads, Free Stuff, New Releases, Reviews and tagged Dethroned Productions, Ever Circling Wolves, Finland, Helsinki, Henri Harell, Hooded Menace, Sludge Swamp, Throne Records. Bookmark the permalink.